Over the next four years, as she endures the deaths of family members, starvation, and brutal forced labor, Raami clings to the only remaining vestige of childhood—the mythical legends and poems told to her by her father. In a climate of systematic violence where memory is sickness and justification for execution, Raami fights for her improbable survival. Displaying the author’s extraordinary gift for language, In the Shadow of the Banyan is testament to the transcendent power of narrative and a brilliantly wrought tale of human resilience. 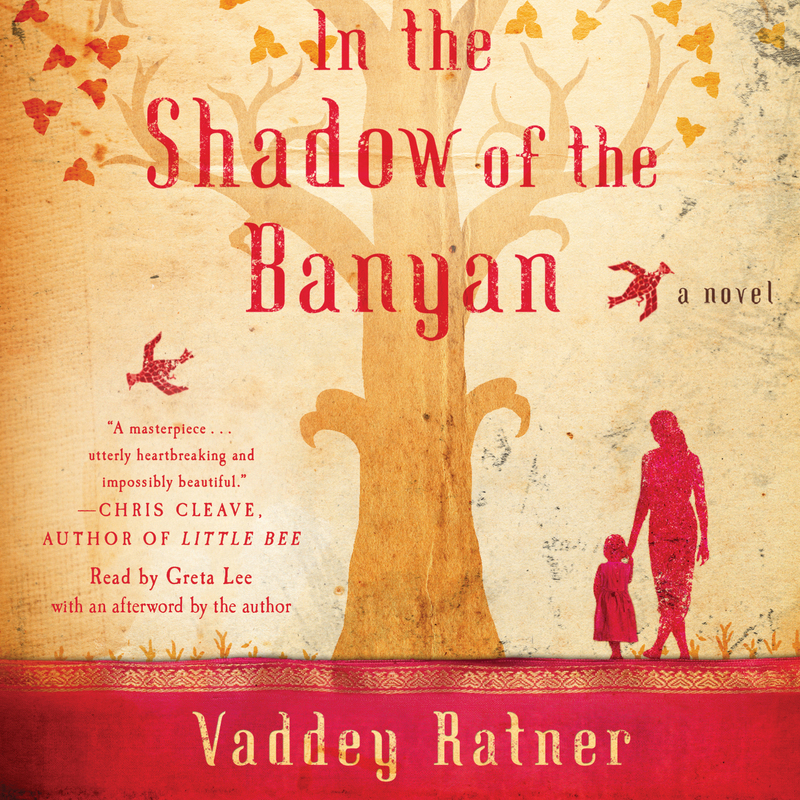 This reading group guide for In the Shadow of the Banyan includes an introduction, discussion questions, ideas for enhancing your book club, and a Q&A with author Vaddey Ratner. The suggested questions are intended to help your reading group find new and interesting angles and topics for your discussion. We hope that these ideas will enrich your conversation and increase your enjoyment of the book. “To keep you is no gain, to kill you is no loss.” For seven-year-old Raami, the collapse of her childhood world begins with the footsteps of her father returning home in the early dawn hours, bringing details of the upheaval that has overwhelmed the streets of Cambodia’s capital city, Phnom Penh. It is April 1975, and the civil war between the U.S.-backed government and the Khmer Rouge insurgency has reached its climax. As Raami plays in the magical world of her family’s estate, she is intrigued by the adults’ hushed exchanges that pit hopes for the long-awaited peace against fears that this might be the end of the life they know, a life protected and cushioned by their royal lineage. On the morning of the lunar New Year, a young soldier dressed in the black of the Revolution invades that world of carefully guarded privilege. Within hours, Raami and her family join a mass exodus as the new Khmer Rouge regime evacuates Cambodia’s cities. 1. According to the prophecy that Grandmother Queen tells Raami at the beginning of the novel, “There will remain only so many of us as rest in the shadow of a banyan tree.” What does the prophecy mean to Raami when she first hears it? How does her belief in the prophecy change by the end of the novel? After reading, what does the title of this novel mean to you? 2. Tata tells Raami, “The problem with being seven—I remember myself at that age—is that you’re aware of so much, and yet you understand so little. So you imagine the worst.” Discuss Raami’s impressions as a seven-year-old. How much is she aware of, and how much (or little) does she understand? 3. Review the scene in which Raami tells the Kamapibal her father’s real name. How does this serve as a turning point in the novel—what changes forever after this revelation? How does it affect Raami, and her relationship with both Papa and Mama? 4. Papa tells Raami, “I told you stories to give you wings, Raami, so that you would never be trapped by anything—your name, your title, the limits of your body, this world’s suffering.” How does the power of storytelling liberate Raami at different points in the novel? 5. Compare Mama’s and Papa’s styles of storytelling. When does each parent tell Raami stories, and what role do these stories serve? Which of Papa’s stories did you find most memorable? Which of Mama’s? 6. Consider Raami and her family’s Buddhist faith. How do their beliefs help them endure life under the Khmer Rouge? 7. Discuss Raami’s feelings of guilt over losing Papa and Radana. Why does she feel responsible for Papa’s decision to leave the family? For Radana’s death? How does she deal with her own guilt and grief? 8. What does Big Uncle have in common with Papa, and how do the two brothers differ? How does Big Uncle handle the responsibility of keeping his family together? What ultimately breaks his spirit? 9. Raami narrates, “my polio, time and again, had proven a blessing in disguise.” Discuss Raami’s disability, and its advantages and disadvantages during her experiences. 10. Although Raami endures so much hardship in the novel, in some ways she is a typical inquisitive child. What aspects of her character were you able to relate to? 11. Discuss how the Organization is portrayed in the novel. How does Raami picture the Organization to look, sound, and act? How do the Organization’s policies and strategies evolve over the course of the novel? 12. Names have a strong significance in the novel. Papa tells Raami he named her Vattaaraami, “Because you are my temple and my garden, my sacred ground, and in you I see all of my dreams.” What does Papa’s own name, Sisowath Ayuravann, mean? What traditions and stories are passed down through these names? 13. Consider Raami’s stay with Pok and Mae. Discuss what and how both Raami and Mama learn from them, albeit differently. Do you think their stay with Pok and Mae gave them hope? 14. “Remember who you are,” Mama tells Raami when they settle in Stung Khae. How does Raami struggle to maintain her identity as a daughter, a member of the royal family, and a Buddhist? Why does Mama later change her advice and encourage Raami to forget her identity? 15. Mama tells Raami after Radana’s death, “I live because of you—for you. I’ve chosen you over Radana.” Discuss Mama’s complicated feelings for her two daughters. Why did Raami assume that Radana was her mother’s favorite, and how does Mama’s story change Raami’s mind? 16. At the end of the novel, Raami realizes something new about her father’s decision to give himself up to the Kamapibal: “I’d mistaken his words and deeds, his letting go, for detachment, when in fact he was seeking rebirth, his own continuation in the possibility of my survival.” Discuss Papa’s “words and deeds” before he leaves the family. Why did Raami mistake his intentions, and how does she come to realize the truth about him? 17. How much did you know about the Khmer Rouge before reading In the Shadow of the Banyan? What did you learn? That’s not to say that a memoir doesn’t demand artistry and skill. I’ve read many beautifully crafted literary memoirs—Angela’s Ashes, Autobiography of a Face, Running in the Family, I Know Why the Caged Bird Sings, The Woman Warrior…In my case, because I was so young when the Khmer Rouge took control of Cambodia, and with hardly any surviving family records or pictures as source material, I had only my own mostly traumatic recollections and the understandably reluctant remembrances of my mother to rely on. What’s more, those whom I wished to write about, whose sufferings I felt deserve to be heard and remembered above my own story, are gone. I didn’t want them to be forgotten, and while, as Elie Wiesel has said, one cannot truly speak for the dead, I wished still to re-invoke the words and thoughts they’d shared with me. I felt compelled to speak of their lives, their hopes and dreams when they were still alive. And to do this well, I realized, required me not only to cull from memory and history but also to employ imagination, the art of empathy. Then, when it came to actually learning how to write, I basically did it on my own, at my own slow pace. Except for a community arts program in Minnesota called COMPAS when I was in high school, and a short-story writing course I took at Cornell University, I’ve had no formal training in writing. But I believe there are no better teachers than great pieces of writing: classics that tackle universal and timeless questions, and contemporary writings, from many cultural and linguistic backgrounds, that not only delve into these existential queries but also enlarge my world by transplanting me to a whole new geography of thoughts, feelings, and beliefs. I wanted to do something similar with this story. I didn’t want just to translate my family’s experience, a Cambodian experience, to a foreign audience; I wanted to take the readers and replant them in the fertile ground I’d sprung from, to let them take root and sprout, and to see my world as their own. I wanted them to see Cambodia before it became synonymous with genocide, before it became the “killing fields.” It was once a place of exquisite beauty, and I try to show that not only by locating the readers in the loveliness of the natural world but also by immersing them in the rhythm of a people’s thoughts and sentiments, in its literature and art. Only when we know what existed can we truly mourn what is lost. So, I feel, writing In the Shadow of the Banyan was not just a retelling. It was an act of creation, a long journey toward its realization. From 2005 to 2009, when I returned with my husband and daughter to live in Phnom Penh, a lot of things became clear in my mind. In particular, I got to witness the power of the monsoon, how in a single day the rains could flood the land; the different ways rice is grown and harvested through the seasons; the monumental struggles of the tiny creatures against the elements. I would spend hours with my little daughter watching a dung beetle fighting its way out of a cow pie! It was an epiphany. Living there—while at times difficult because of its proximity to the past—helped tremendously with the writing of In the Shadow of the Banyan .